WONDERING HOW TO IMPROVE YOUR BALANCE? TAKE THE JUMPSPORT FITNESS TRAMPOLINE CHALLENGE! Start by standing with one foot in front of the other; toes of left foot touching heel of right foot. Now, hold this position for 30 seconds… with your eyes closed. Not easy, right? Stability, steadiness, equilibrium: all add up to balance. Regardless of who you are, balance plays an important role in your life. Yet, most days we take our balance-ability for granted. Balance is established by maintaining your center of gravity over your base of support (also known as feet). The balance equation includes vision, the vestibular system (the internal ‘gyroscope’ in your inner ear), and your proprioception system. Simply put – it’s your body’s sensory system that processes and coordinates sensations of touch, pressure, and vibration – muscle activities that perceive your body parts’ relative positions to each other. These sensory tools also send your body and brain signals and feedback about your body’s position in space. I have not been this excited about exercising and increasing my cardio for a very long time. I have balance and muscle issues due to MS, and doing the trampoline videos is helping immensely. HOW DOES THIS RELATE TO WORKING OUT ON A FITNESS TRAMPOLINE? Learn how to improve balance with the JumpSport Fitness Trampoline! The jumping mat of a rebounder flexes in all directions, meaning the mat creates a challenging stimulus for your sensory systems. Rebounding also creates a condition of constantly varying gravitational force on your body throughout a jumping cycle. The motion of bouncing up and down – working with and against gravity – is a break in your normal rhythm of movement. This additional dimension added to your range of motion, creates an extremely effective exercise to help invigorate your balance system and ensure it stays strong and healthy. To challenge and learn how to improve balance-ability try specialized rebounding exercises known as “balance-challenges” designed by JumpSport Fitness Professional, Abbie Appel, and found on her BODY Bounce Circuit Trampoline Workout DVD. We also offer some balance exercise for senior ideas. As a result of Abbie’s use of the JumpSport trampoline in her training classes, her clients have improved their coordination. Even those who had difficulty standing on a trampoline at first had better control of their balance after just two workout sessions. 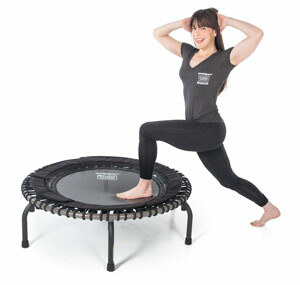 Balance training on a JumpSport Fitness Trampoline keeps your workout lively and fun. Kids, parents, and even grandparents can participate in safe rebounding exercises that improve equilibrium. Find the right JumpSport Fitness Trampoline today and give yourself a more balanced tomorrow! Start teaching yourself how to improve your balance today!